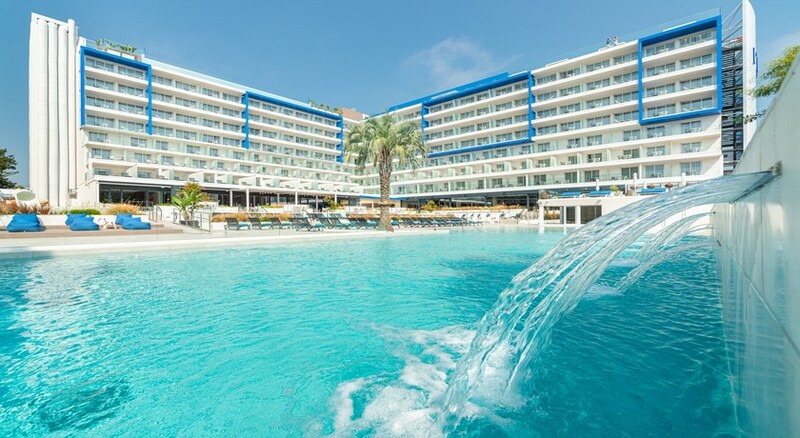 Hotel L’Azure is just a few minutes from the lively nightlife resort of Lloret. The hotel has a pool with a perfect setting of palm trees where you can soak in the sun on loungers. The hotel features a nightlife program that offers flamenco shows and live music. 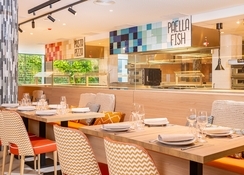 It has a buffet restaurant that offers Catalan cuisine and Spanish and international dishes. There is also a bar available to guests. There is a supervised children's park and club for children between 4 and 12 years old. Various activities are offered, such as painting and various games 6 days a week. The rooms have balconies overlooking the pool. 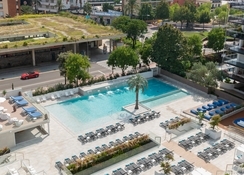 Hotel L’Azure is located in Lloret de Mar. 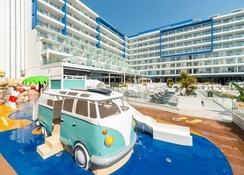 The hotel is about 350m from the beach and the Girona-Costa Brava Airport is around 28km from the hotel. Lovely Barcelona is around 77km from the property. 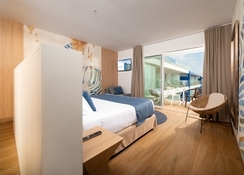 Hotel L’Azure offers everything you need to have a good stay in Lloret de Mar. All rooms have balconies facing the sea and a full bathroom. They also have a telephone, satellite TV and a safe as well as cots for children. You will feel at home in any of the 411 rooms. The Wi-Fi Internet connection (for a fee) will keep you in touch with yours; you can also watch your favorite show on the television with satellite channels. The bathroom has a bathtub and bidet. Amenities include a telephone, as well as a limited cleaning service. Hotel L’Azure features a restaurant which offers international, Mediterranean and authentic Spanish cuisine. For breakfasts, the hotel cafeteria hosts a continental buffet. You can also enjoy the poolside snack bar. 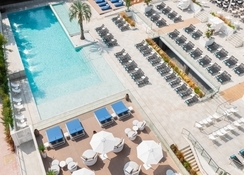 Among the services of Hotel L’Azure you can find the mini-club, animation, swimming pool, solarium, sauna, car rental, excursions, 24-hour medical service and much more although some of these services may not be included in the price. Reception is open 24 hours. Relax on the terrace for sunbathing or in the hotel's sauna or practice table tennis, archery and billiards. On the other hand, the hotel also offers dances and a program of activities and entertainment several times a week. Very good hotel. Nice service and food. Close to beach and the most important street. Every day a room was cleaned and left in perfect condition. I stayed at this hotel for a 3 night hen break, after booking I read the reviews and was so worried that I had made a written decision but it is definitely not as bad as it is made out to be. The rooms are basic and the hotel itself could do with a good freshen up, the buffet is not amazing but you get what you pay for. There were a few rowdy guests but it is to be expected when the hotels are very limited for stag/hen party's. The reception staff were very friendly and the barmen were friendly and funny and made us feel welcome. Nice hotel, clean and very nice hotel staff. If we had travelled as a couple it would have been perfect but we had our 13 week old baby and the walls are thin and the noise from the other residents is awful and non stop from 9pm until around 4am. The food is great but a little repetitive. I would return but not with children. Went as a older family, most of the staff were fine and helpful but the bar staff were rubbish slow could not be bothered .the room was basic clean towels changed every day. Food was hit and miss one day good next day bad. But all in all you get what you pay for.